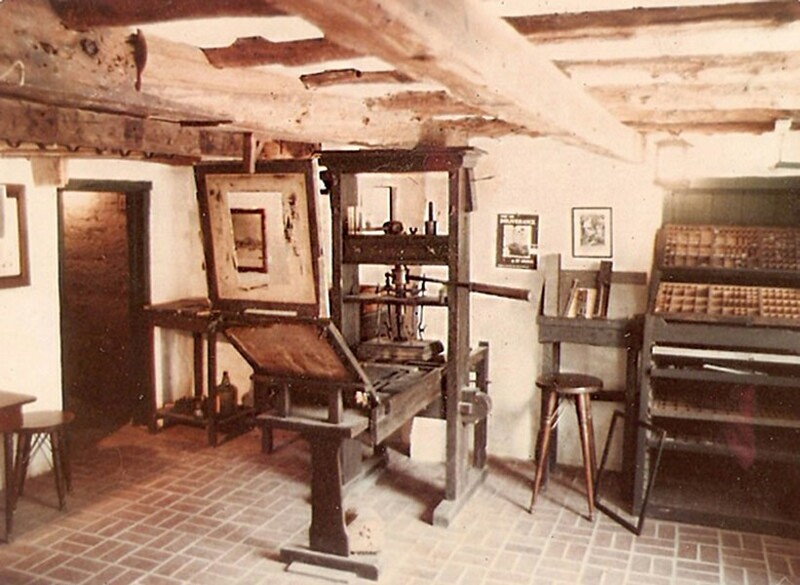 The Featherbed Alley Printshop Museum, St. George's, Bermuda, features a replica Gutenberg Press. 1. The printing press. Printing involves transferring ink to paper under pressure. Gutenberg adapted the traditional screw-driven wooden wine press of his time to avoid the smudging that would otherwise result from the screw's rotation as the type pressed against the paper or vellum. 2. Metal alloy for type. Before Gutenberg, type was composed of bronze or tin. Gutenberg, who had been a goldsmith by trade, discovered (or learned from someone else) that the addition of antimony to a mixture of lead and tin minimized shrinkage and cracking as the molten type pieces cooled. 3. Hand casting molds. Of all Gutenberg's inventions and adaptations, his design for a flexible, reusable hand mold for casting type was probably the most important. His molds could be used multiple times to cast identical copies of the same symbol rapidly and economically. 4. Moveable metal type. Printing on wooden blocks was invented around 200 AD, but the British Museum's beautiful copy of the Buddhist Diamond Sutra, the oldest dated printed book, is from 868 AD. Sometime around 1100 AD, moveable type — individual symbols on separate blocks — was invented in China using wood and ceramic cubes. Later, in 1377, more durable moveable metal type was used in Korea to print the Jikji Buddhist teachings. The thousands of individual characters needed hindered progress in mechanizing printing in the East. Gutenberg and his successors in Europe, however, needed fewer than 80 letters, numbers and punctuation marks. 5. Oil-based ink. Traditionally, scribes used water-based inks to copy manuscripts, which also worked for wood-block printing. Water-based ink doesn't adhere to metal, however, so Gutenberg adapted oil paints used by artists to formulate ink from lampblack, linseed oil and egg white. By taking these separate elements and combining them into an integrated system, Gutenberg was able to produce books accurately, rapidly and cheaply compared with manual copying. For the first few decades of mechanical printing, books looked and felt much the same as they had before Gutenberg: big and heavy, with a fat Gothic typeface to match. The printer and humanist Aldus Manutius changed that in 1501 with his pocket-size copies of Greek and Roman classics, using two innovations: a light italic typeface that increased both legibility and the number of words on a page; and folding the printed sheets into eight parts and cutting them after printing to produce the "octavo" size. Other than Manutius' breakthroughs, Gutenberg's mechanized system of book production remained essentially unchanged for 300 years until the 1800s, when steam power ushered in a secondary revolution in printing. We may still prefer reading tree-based books over computerized pixels (see "Pixels or Paper?" Nov. 18, 2013), but the era of Everyman curling up in a chair with a delicious novel, entering the author's heart and soul, may be coming to an end, according to many commentators. Gutenberg's gift may have been a temporary one, lasting about 500 years, as our easily distractible brains adopt the new paradigms of the digital age. Barry Evans (barryevans9@yahoo.com) curls up every night with his iPad Mini, but his Field Notes anthologies in local bookstores are still tree-based.